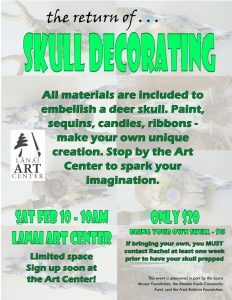 Home Classes	Skull Decorating Returns! Back by popular demand- skull decorating! Thanks to the talents of local artist Rachel Lauter, we are able to present an activity reminiscent of the artwork often seen at Dia del Muertos. You will get the opportunity to glorify one of the skulls of our plentiful residents, axis deer! We will supply materials such as paint, sequins, and ribbons. You supply the magic! The cost is only $20 for this unique opportunity, skull included. You can also bring your own skull and save 5 bucks. If you intend to bring your own skull, you MUST contact Rachel at least one week before the event so it can get properly prepared. This will take place at our big project table inside the Art Center gallery. There is limited seating so advanced reservations are highly recommended. If you missed out last time, don’t delay. You can drop by the Art Center for inspiration and to sign up. See you there! Last Fifth Friday of 2016!